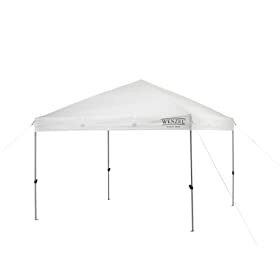 Wenzel Smartshade Canopy sets up in minutes and has three settings on the legs for height adjustment, with the tallest at 76-Inch. Batwings and guyouts provide added stability in windy conditions, with patented dual stabilizer arms in each corner for added eave support, easy-release buttons that won't pinch fingers and ensure quick and easy assembly. Smartshade Canopy comes in an expandable, wheeled duffel bag for easy transport and a carry weight of 37-Pounds.